The “midbrain activation training and Brain activation of talent intelligence of children MCB” (Multiple Intelligence Method) is training that can stimulate the whole brain so that the child is expected to have a balance left and right brain so it is easy to access both sides of the brain. And is also able to generate Self Motivation for children and parents and teachers as well as principals or other institutions. 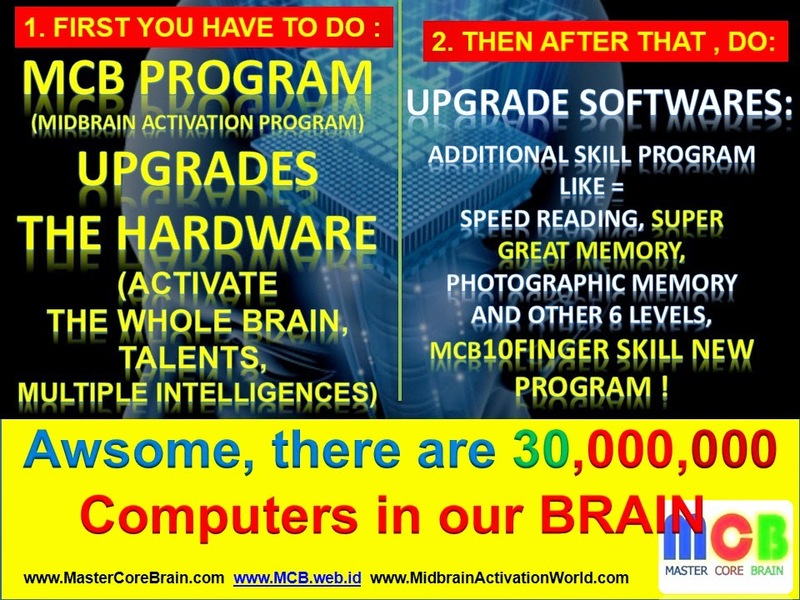 The midbrain activation training and Brain activation of talent intelligence can be MCB child in the following analogized, this training is a HARDWARE processor (though Computers, namely the Human Brain) and all areas of learning or science is taught in school / in tutoring / in the course and from any source is as processing SOFTWARE (programs for the computer's performance, in this case the programs to make the human brain more active). But in reality, the current is given by Master SOFTWARE in education in public schools are still lacking to enable HARDWARE (Human Brain) of the Multi Intelligence, still dominant enable the Left Brain, causing imbalance of human intelligence. There are not many midbrain activation training and Brain activation of talent this kid's intelligence, and also does a lot of school or tutor who has SOFTWARE (school lesson, Lesson Program) which is able to activate the Multiple Intelligences children, the ability of teachers who are not evenly distributed to teach or even activate the brain's ability Smart kids (which is referred to as the Successor of this nation). That is why, MCB Master Core Brain dare to take steps and concrete actions in the dream Let Intelligent Nations for a better world. implementation of dozens of times already midbrain activation training and activation of talent intelligence of children MCB, and several other countries around the world. In addition resulted in the achievement of each child participants of “midbrain activation training and Brain activation talents MCB” child's intelligence increased dramatically, also there is a change towards a better increase again in Crafts, Independence, Respect for Parents and Teachers, noble character, and most important is these children are able to absorb all SOFTWARES given by any teacher or from a variety of sources of information. The impact occurred in the School Achievement increased value, Soul also widening Arts in Art drawing, singing, playing musical instruments, dancing, and other good things expected by many parents in general. And the good effects of this training is a LONG TERM MEMORY until they grow up (even to the elderly). So in other words is the midbrain activation training and activation of talent intelligence of children MCB very helping children to receive the program any good science lesson, is also very helpful for parents and teachers where they work so much lighter and capable of directing the child be desirable parents and teachers, in addition to other capabilities of multiple intelligences children. It is interesting, as a "bonus" of midbrain activation training and activation talents MCB child's intelligence is active brain wave was able to make children do activities with your eyes closed, alias has the ability blindfold. Children are able to read, to guess the card, guess the color, read the newspaper headlines, walking / cycling with eyes closed, playing games in the PC with eyes closed and so on .. The brain needs to be enabled because if left naturally, the majority of children will have a dominant left brain than right brain. The result is a right-brain function marginalized when it is stored in the right brain skills are superb including visualization capabilities and intuition so that children are able to see with your eyes closed. Thus, midbrain activation training and activation of talent intelligence of children MCB is an activity that is performed in order to maintain the entire ability of the human brain (including the adult brain). Post-activation of the brain, the children will have an easy access both to the left and right brain. With easy access, they will learn, read and memorize the objects in a faster pace and thereby increase confidence, interest and their concentration in the study. Post-activation of the brain will also open INTUITION children so that they can move with eyes closed like guessing cards, reading, walking, cycling, shooting and so forth. Intuition is the human ability to obtain perceptions about everything in a very fast / instantaneous, or "The ability to think without thinking". The latest book discusses scientifically about intuition is BLINK Malcolm Gladwell. We must understand that in the right hemisphere is no such thing as intuition. Children are able to move with eyes closed means intuition has been active. Practicing with your eyes closed is not intended for children to be "ninja" but intended to remain active and growing intuition honed. With active intuition will be useful in all areas of human life regardless of background and profession. Successful world-class people like Warren Buffet and George Soros who play in the risky business as Stock and Foreign Exchange also admitted that intuition plays an important role in taking decisions and not simply rely on mathematical analysis (technical) and fundamentals alone, means the left brain (analytical ) and right brain (intuition) they are in balance. Albert Einstein, scientists also utilize his intuition once said: "I did not find my understanding of the universal laws only with an analytical mind." Akio Morita and Sony, Howard Shcultz of Starbuck and Sir Richard Bronson of Virgin Airline reinforces the importance of intuition in creating new products, inonvasi business that not only produce great wealth but also helps millions of other human beings. 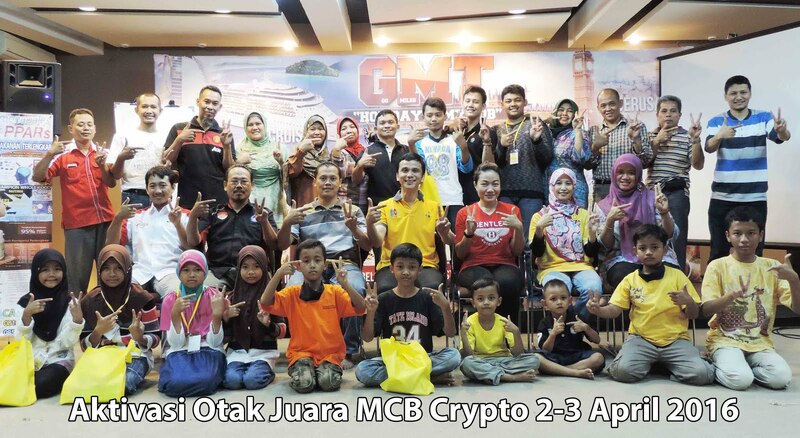 there are many more activities other children excel, thanks to training MCB Training Program. MidBrain Activation is the modern scientific term of " Shiva's third eye" It gives Extra sensory powers, Intuition, memory, learning ability, grasp, understanding, discrimination,emotional stability , EQ, IQ. higher utilisation of Mind,It can be done in children from 4 years to 15 years old. This MCB video gives reasonable glimpses of workshop and the proof of activation (blindfold reading). Please get rid of all your worries - get rid of parental problems - get rid of unnecessary expenses in various educational aids - activate the Midbrain of your child and make him self reliant , joyful and successful. with Midbrain activation, your child can reach the exceptional heights on that path. Please share this knowledge with your friends and relatives and take the world to the Golden Era. Please see the video and call me on +6285213118462 and +6287873600620 for any further enquiries. Often parents force children to participate in various les / her lessons in order for the child to be smart, but we did not realize how their childhood is lost because of the density of these activities, childrenworld of playing to be lost because of our selfishness as parents who want their children to smart a way to impose our own will without thinking about the comfort of the child with a myriad of activities. To include your child in brain activation program, then your child does not need a myriad of activities that will take their childhood, because once the brain is activated, the function of the left brain and right brain will run in a balanced manner. The left brain is no longer pressing the right brain. Predictive ability, memory, art and reflex ability not only be grown, but managerial skills and understanding of the child can be maintained. People like this would be to have a sense of love, including older people, have intelligence and harmony. Restoring proper initial potential possessed by humans, so enough with the lessons and activities in schools, children can be more intelligent and genius. Similarly, the parents and the adults who daily face many problems issues that tend to make people can not control their emotions and one's own negative thoughts, so many problems that can not be resolved in the near future. By including them into the training we make, it is expected that parents and adults getting Solutions and also methods to be able to do everyday in his life so as to face the other problems in future.